Look for TaylorMade-adidas Golf to officially unveil its new SLDR driver on July 29. Equipment sales – for all companies – have been slow this year, this it will be interesting to see if the SLDR, with sliding weight bar, will move the sales needle. The SLDR introduction makes for three new drivers TMaG will have introduced this year – R1 and RBZ Stage 2 being the other two. 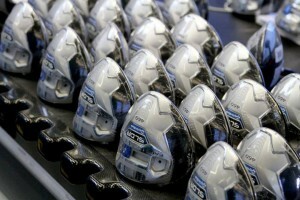 Metal woods rival Callaway Golf also has launched three drivers so far this year – RAZR Fit, FT Optiforce and XHot. Who says there is no confusion in the market place?